SES applies technologically advanced monitoring systems to meet the stringent demands on this high profile project, which forms part of Britain's most ambitious rail scheme in decades. 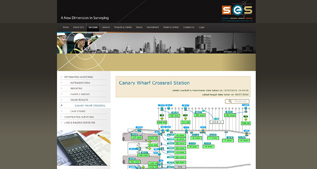 Under a specification designed by Arup, SES have planned, installed and implemented the project's unique monitoring system. Crossrail is a 118km long east-west London rail link that is due to be operational in 2017, part of the route involves tunneling 21.5km under central London. 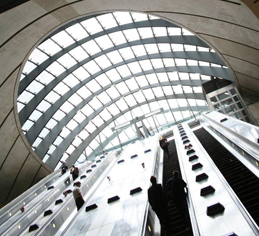 A series of stations are planned for the route and the new station at Canary Wharf is now currently under construction. When complete, the station box will be 256m long and up to 30m wide. The site sits in the north dock of West India Quay with the base slab 16m below the dock bed and 25m below water level. The structural backbone of the station box consists of 295 colossal 18.5m long, 1.2m diameter steel tubular Giken piles, which form the cofferdam. The primary structural support for the coffer dam wall consist of a series of anchor piles offset in the dock with tie rods connecting the anchor piles to the Giken piled wall. This method of support allows works to commence within the drained coffer dam without the need for internal propping at the upper levels. The Giken Piles are monitored using 21 inclinometers, with a further 16 inclinometers being strategically installed in corresponding anchor piles. With this data SES creates deflection plots which accurately indicate the extent of movement at specific intervals along the full depth of the piles. 21 load cells have been installed at key locations where the tie rods connect to the piled wall. The load cells, via an automated system, measure the force in the tie rods caused by the water pressure at the back of the wall while the dock is drained. This system will also be essential during the excavation of the station box to full depth. A real-time monitoring system involving 4 robotic total stations is also operational. The instruments automatically survey 60 glass prisms on the capping beams and anchor pile heads. The use of robotic total stations ensures regular monitoring of the structure on a continuous basis. The field data captured by the instrumentation and data logger is sent back to the SES office and turned into a more user-friendly format i.e. reports, graphs and tables. All of the information is provided by a site-specific password protected website that is updated in real-time. The website not only shows the latest readings, but also provides a portal for all historical information and links the site weather station, webcams, construction diaries and other related information that is useful in interpreting the monitoring results. Handling over 9,000,000 passengers a year and by 2013, passenger numbers are expected to reach 14 million, and as much as 26 million by 2030 it's no surprise MACE Group was brought in to build the South East Pier which provided an extra 6 gates to the existing main terminal. Our role as Project Surveyors meant that we were involved from the start to final handover. A large topographical verification survey had to be carried out which enabled Mace to plan with confidence all logistics as temporary fence lines were erected to partition landside to airside operations. 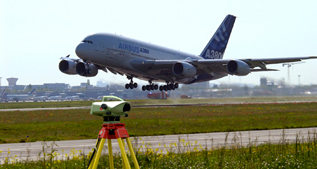 As-built surveys were needed to establish exactly the position of the main terminal to allow for the fabrication of steel connection beams. Internal works entailed ground floor blockwork, stud partition walls and first floor gridlines to be set out. Heathrow is the UK's largest and the world's busiest international airport, carrying over 68 million passengers and 1.3 million tons of cargo each year. SES has a long standing history with Heathrow Airport and its transformation into a state of the art transport HUB. 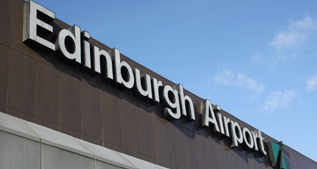 For the past 16 years SES have applied our experience and knowledge to the multi billion pound project working on Terminal 1, Terminal 2, Terminal 3, Terminal 5 and the Midfield Pier Project. Our site teams work both landside and airside with MACE Group, Balfour Beatty and various other trade contractors to deliver a successful, cost efficient service to the aviation sector. Preconstruction Services - Topographic Surveys, full feature surveys comprising of building lines, road lines, services, contours, embankments etc. Project Management - Site Control, establishment of grid lines and datum's. Construction Management - Setting out, ground works, internal building surveys. Quality Assurance - Final as-built surveys for the sign off of works. SES is proud to be a part of this major UK landmark.